One look at this cover and I was sold. Not to mention the Helen of Troy aspect of the story. Helen Hamilton has spent her entire sixteen years trying to hide how different she is—no easy task on an island as small and sheltered as Nantucket. And it's getting harder. Nightmares of a desperate desert journey have Helen waking parched, only to find her sheets damaged by dirt and dust. At school she's haunted by hallucinations of three women weeping tears of blood . . . and when Helen first crosses paths with Lucas Delos, she has no way of knowing they're destined to play the leading roles in a tragedy the Fates insist on repeating throughout history. The initial hatred between Helen and Lucas (while I get it in the framework of the story) was off-putting (you know they're going to get together, let's just do this thing already!) I really wish the YA genre (in general) would bust out of this mold (which is somewhat that of many "romance" novels) where the two leads hate each other on sight and then develop an enduring, passionate love for each other. I get the device. It has been used in storytelling from Taming of the Shrew and every Hepburn/Tracy movie all the way up to Moonlighting, Cheers, Friends, The Vampire Diaries and Twilight. It's just that, when it's not done well or convincingly, as it was in those examples (well maybe not Twilight) it seems contrived and a little manipulative of the author ("this is the formula and I'm sticking with it even though it doesn't make a whole lot of sense"). I hate you! I love you! I love to hate you! ﻿The hatred between Helen and Lucas (I know, I know, it was The Furies and Destiny) simply could have been done in a better and more believable way. 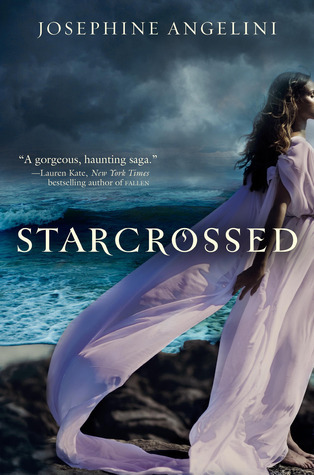 Many people have been comparing Starcrossed to Twilight and while I can see why (similarities abound), I'm not sure that in and of itself is a reason to stay away from Starcrossed. "You in the mood for Greek tonight?" ﻿ Helen has a good sassy vibe about her (once she stops hiding behind her hair) and her relationship with Lucas (once it finally gets going) is sweet and easy to believe. The plot was filled with suspense (hence the staying up to finish it) and I am looking forward to the sequel.